Rabbinical authority in Siponte; born probably about 1040. Conjointly with his somewhat older colleague, Kalonymus ben Shabbethai, he signed a rabbinical responsum before the latter removed to Worms, 1070. His colleagues in Siponte were Melchizedek ha-Ko-hen and Elhanan. 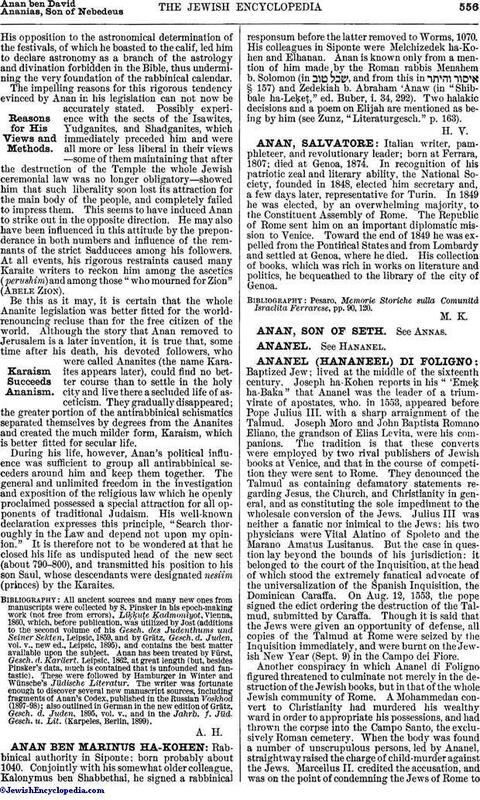 Anan is known only from a mention of him made by the Roman rabbis Menahem b. Solomon (in , and from this in § 157) and Zedekiah b. Abraham 'Anaw (in "Shibbale ha-Leḳeṭ," ed. Buber, i. 34, 292). Two halakic decisions and a poem on Elijah are mentioned as being by him (see Zunz, "Literaturgesch." p. 163).